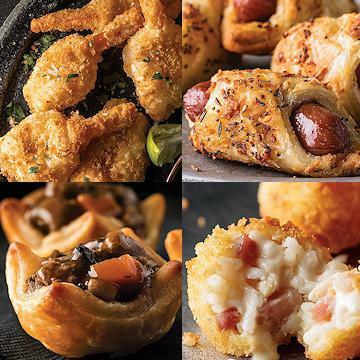 Savory favorites with just a hint of sweet, there's plenty for you and your guests to sink your teeth into when you get your hands on this collection of appetizers hand selected for your holiday get-togethers. Your guests are certain to swoon over our one-of-a-kind Filet Mignon Bites - perfect portions of our world famous filet mignon inside flaky pastry crusts. Or treat them to our classic crispy, savory-sweet Coconut Shrimp - these, and many more decadent delights await to take your event to new heights of gourmet. Better yet, they're all oven-ready so you just heat and serve! Effortless entertaining is at your fingertips, all at an unparalleled value you'll simply love. Order today!